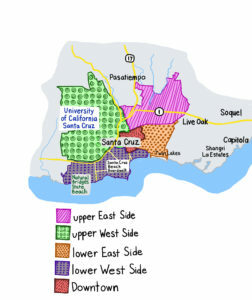 The Santa Cruz Police Department (SCPD) is instating a new neighborhood policing strategy that will divide Santa Cruz into five distinct neighborhoods to focus on issues common to each established neighborhood. This new policing will start March 1. Changing strategies comes as a renewed effort to reduce crime in the city. On the city crime rating site Neighborhood Scout, Santa Cruz has a crime index rank of 1, where 100 is the safest. The five neighborhoods recognized by the police department are upper Westside, upper Eastside, lower Eastside, lower Westside and downtown. Each neighborhood will have an assigned police lieutenant, sergeant and staff of officers. While Santa Cruz has issues that span all neighborhoods, Mills said, certain neighborhoods face unique issues such as illegal RV parking in lower Westside, car theft in downtown and houseless camping in upper Westside. The Santa Cruz City Council and city manager Martín Bernal helped the SCPD with deciding how to break up the five neighborhoods. SCPD currently implements the community policing strategy, which is similar to neighborhood policing but works with the community as a whole to address issues from the whole city and county instead of separate neighborhoods. Mills said SCPD believes neighborhood policing will be more efficient because issues vary from neighborhood to neighborhood. Mills said two of the most effective policing strategies are Compare Statistics (CompStat) and neighborhood policing. CompStat uses preemptive techniques such as stop-and-frisk based off of analyzing spikes in crime. The stop-and-frisk strategy often results in racial profiling when adopted by other cities. Mills, while acknowledging the effectiveness of CompStat, did not believe it would work for the Santa Cruz community. Instead, Mills hopes neighborhood policing will act as a preemptive technique by using feedback from each neighborhood’s residents such as reports of activities that damage their community. Food Not Bombs (FNB), an organization that frequently advocates for Santa Cruz’s houseless population has monitored SCPD’s treatment of houseless persons. FNB is not collaborating with the SCPD but intends to keep watch for any future unfair treatment of houseless residents. FNB hopes SCPD may reconsider certain policies that FNB has opposed in the past, such as ticketing houseless residents for sleeping in banned areas, under its new policing strategies. Officers in their designated neighborhoods may work with local organizations, such as neighborhood watch and schools, to educate residents on safe crime prevention techniques custom to their specific needs. Mills’ goal for this switch is to move from responding to emergencies to working with neighborhoods to preventing them in the first place. With the new changes in March, the SCPD will hold community meetings for each neighborhood where residents can take part in setting their neighborhood’s priorities.